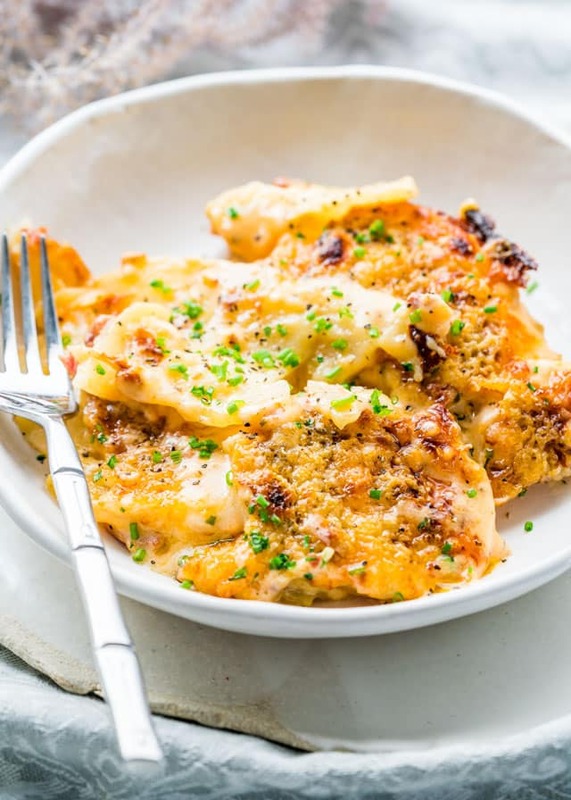 Learn how to make these delicious Loaded Scalloped Potatoes with lots of bacon and cheddar cheese. Comfort food at its finest, easy to make and you’ll end up with cheesy, creamy, tender potatoes every single time! One of my favorite side dishes ever, right next to mashed potatoes, has to be these scalloped potatoes. They are loaded with cheese and bacon, they’re super creamy and so tender. What can I say other than I love my comfort food, and these scalloped potatoes scream comfort food. While scalloped potatoes are usually a holiday side dish, I love mine for our Sunday dinners next to a nice roast chicken. My favorite part about these potatoes though has to be that top crust. This is why usually I like to put the broiler on for the last 5 minutes to get a nice crust going on, but maybe that’s just me. Sometimes I don’t even have them as a side dish, I just scoop some up into a plate and enjoy them on their own, they really are filling and fulfilling. Scalloped potatoes are probably different everywhere. We know them as a dish of sliced potatoes with a dairy-based sauce which is either milk or cream. It’s a white sauce that is poured over the potatoes, then they are topped with cheese and/or breadcrumbs. The sauce is similar to a bechamel sauce, equal parts butter and flour, then add in your liquids and spices. I added some garlic to my sauce because otherwise it wouldn’t be a Jo Cooks recipe if there was no garlic. Butter – use unsalted butter so that you can control the sodium content in your cooking. Flour – you need all-purpose flour. 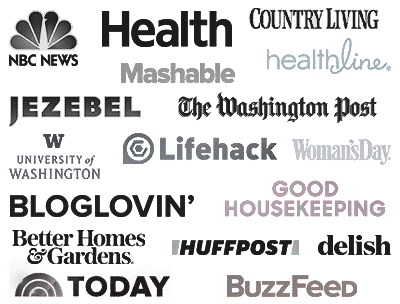 Heavy cream and chicken broth – I chose heavy cream and no sodium chicken broth. If you want to cut out some of the fat, you could use milk but if you’re making this for the holidays I recommend you go all out and use heavy cream. 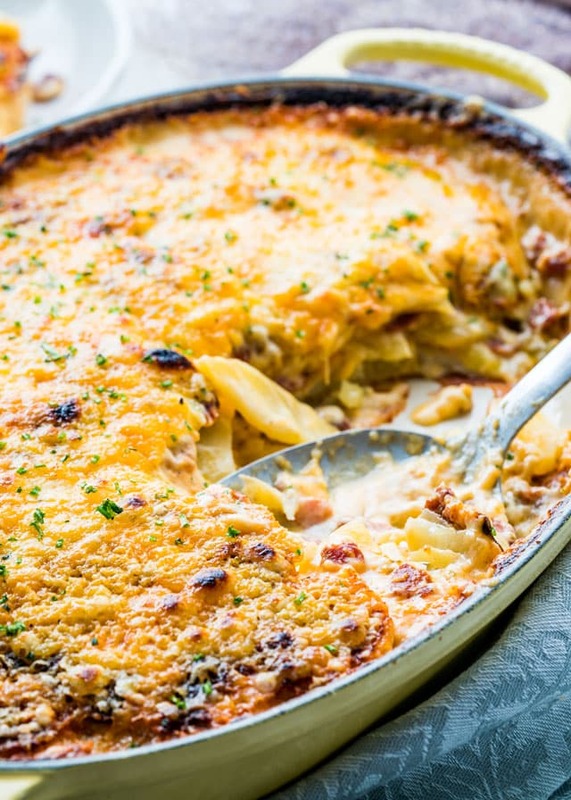 Garlic – this is optional but I love a little bit of garlic in my scalloped potatoes. Spices – salt, pepper and nutmeg. If you don’t like nutmeg feel free to skip it, however nutmeg is such a great addition to these potatoes. Cheddar cheese – this is what makes these potatoes super cheesy. 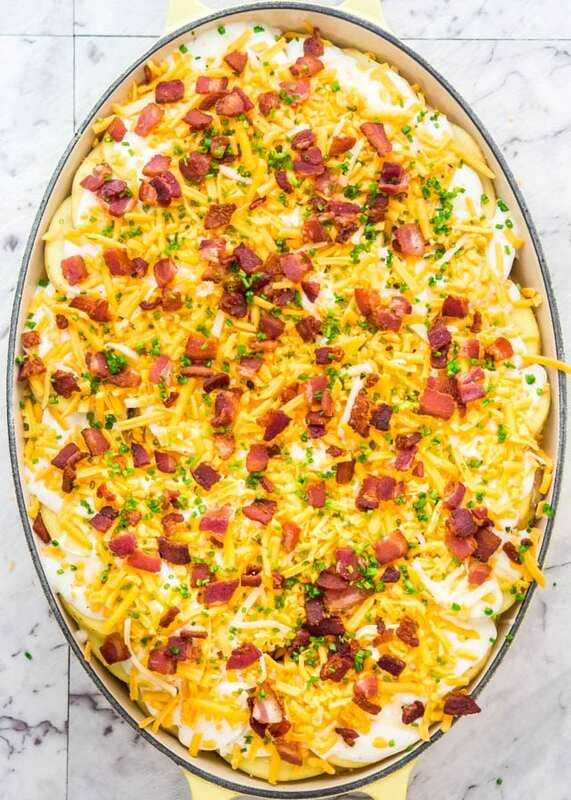 Bacon – I would say the bacon is optional but we all know bacon makes everything better so you MUST add bacon, because if you’re going to have scalloped potatoes you might as well go all out. Chives – I like to garnish with a bit of chives because I love the subtle onion flavor they provide. You can use parsley instead. Make the sauce: Melt the butter in a saucepan or skillet over medium heat. Add the garlic and saute just for 30 seconds until the garlic is aromatic. Sprinkle flour over the garlic/butter then whisk until well combined. At this point it should look like a thick paste. Stir in the chicken broth and whisk until combined. Add in the heavy cream and whisk until smooth. Season with salt, pepper and nutmeg and remove from heat. Layer the scalloped potatoes: Start with a spreading a couple ladlefuls of the sauce over the bottom of a 9×13 inch baking dish. Spread a third of the sliced potatoes over the sauce in an even layer (see video). Top with more of the sauce to cover the potatoes. Top with a third of the cheddar cheese and then a third of the bacon. You should have enough ingredients for 3 layers of potatoes. Continue layering with potatoes, sauce, cheese, bacon and repeat. Finally sprinkle with half the chives. Bake: Cover with foil and bake for 45 minutes in a 400 F degree oven. Uncover and finish baking for for another 45 minutes or until the potatoes are fork tender. Starchy potatoes are best, which is why I prefer Yukon Golds. Russets have the most starch and make the creamiest sauce, but Yukon Golds hold their shape better. Make ahead tip: Prepare everything up to and including step 5, cover with foil and refrigerate over night. The next day when ready to bake preheat the oven and bake as instructed. Yes, you can, however freezing scalloped potatoes may cause the texture and flavor to change. Store them in an airtight container and freeze them for up to 2 weeks for best results. You can also freeze them in the dish they were baked in, but cover it tightly with aluminum foil or plastic wrap. Learn how to make these delicious Loaded Scalloped Potatoes with lots of bacon and cheddar cheese. Comfort food at its finest, easy to make and you'll end up with cheesy, creamy, tender potatoes every single time! Melt the butter in a saucepan or skillet over medium heat. Add the garlic and cook for 30 seconds until the garlic is aromatic. Sprinkle the flour over the garlic/butter then whisk well until combined with the butter. Add the chicken broth and whisk until combined. It should look like a thick paste. Cook for another minute while stirring, then add the heavy cream and whisk until smooth. Season with salt, pepper and nutmeg. Continue cooking for 2 more minutes until the sauce comes to a simmer and thickens. Remove the saucepan from the heat and set aside. Start layering. Start with a spreading a couple ladlefuls of the sauce over the bottom of a 9x13 inch baking dish. Spread a third of the sliced potatoes over the sauce in an even layer (see video). Top with more of the sauce to cover the potatoes. Top with a third of the cheddar cheese and then a third of the bacon. You should have enough ingredients for 3 layers of potatoes. Continue layering with potatoes, sauce, cheese, bacon and repeat. Finally sprinkle with half the chives. Cover with foil and bake for 45 minutes. Uncover and finish baking for for another 45 minutes or until the potatoes are fork tender. Garnish with remaining chives and serve warm. Leftovers: Store leftovers in an airtight container for up to 5 days. *Make ahead tips: Prepare everything up to and including step 5, cover with foil and refrigerate over night. The next day when ready to bake preheat the oven and bake as instructed. 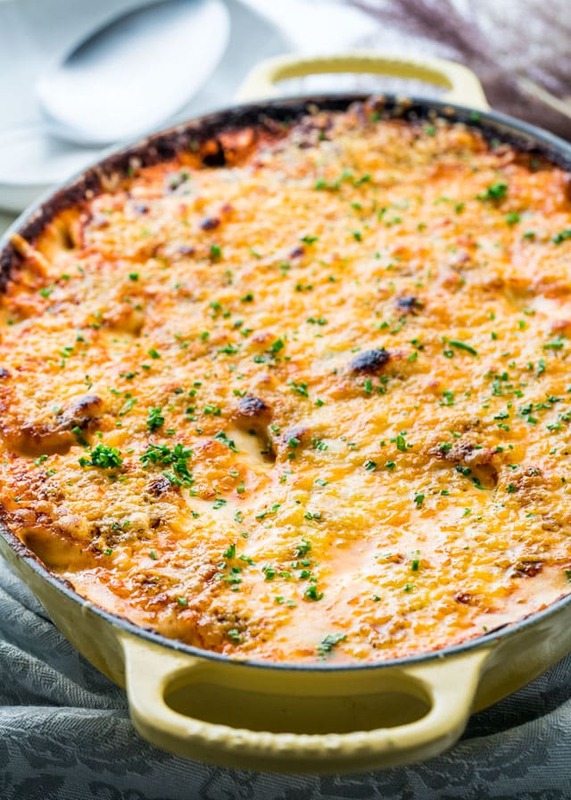 Love your recipe for loaded scalloped potatoes…there are only two of us and I want to 1/2 the recipe for us for Christmas with our beef….have you had any luck with cutting it in 1/2? Many thanks for this answer and your website, which I love. You can absolutely cut it in half! You’ll just have to use a smaller baking dish than what we used. 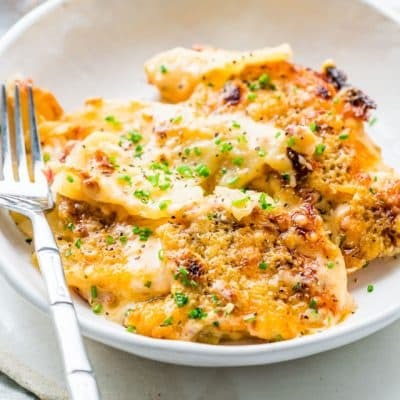 No to be a stickler, these do look phenomenal and I will make, however these are technically potatoes au gratin, since traditional scalloped potatoes do not use cheese at all. Thank you for the great recipe. I could eat the dish on its own! 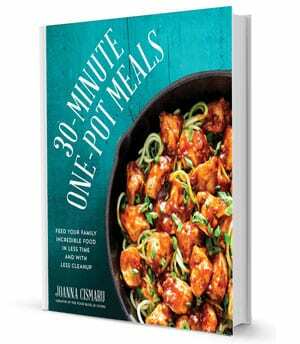 Because all the positive comments I plan to make this for my Christmas Family Dinner. I’m sure they will like it with BBQ Ribs. Thanks for the compliment, Charles! So happy you liked the recipes! I substituted tapioca flour for the wheat flour, due to a medical issue my girlfriend has. That made getting the roux-based cream sauce to the proper consistency more of a challenge than expected. I ended up with more sauce than I needed, but I’m sure it won’t go to waste (though possibly to waist!). I also used some spiral-sliced ham left over from another dinner in place of the bacon. Apart from those minor changes I made the recipe as directed. This was easily one of the most delicious scalloped potatoes recipes I have tasted. It would be just as impressive served as a side dish at a fancy holiday dinner. It’s definitely a keeper! Thank you, Jo. You scored a home run with this recipe. The final photo there just looks so damn delicious! I’m really looking forward to make this! Loaded Scalloped Potatoes with BACON!! Yes!! These look absolutely delicious! Thanks for sharing the recipe, Jo! This likes delicious, as all of your recipes do! The video says to bake for 1 hour. The recipe says to bake for 45 minutes covered in foil and then 45 minutes without the foil covering. Which is correct? Follow the recipe instructions, those are correct.